Background Flexible flatfoot in children is one of the most common disorders in orthopedics. The mechanism of action of the subtalar implants used for correction of the deformity is still unclear. Purpose The aim of this study was to identify the neurohistological nature of the subtalar tissues in an attempt to clarify the mechanism of action of sinus tarsi implants used for correction of flexible flatfeet. Patients and methods From 46 patients (mean age 39 year, 26 male and 20 female), soft tissue material was excised from the sinus tarsi during operative intervention in the foot for different indications. 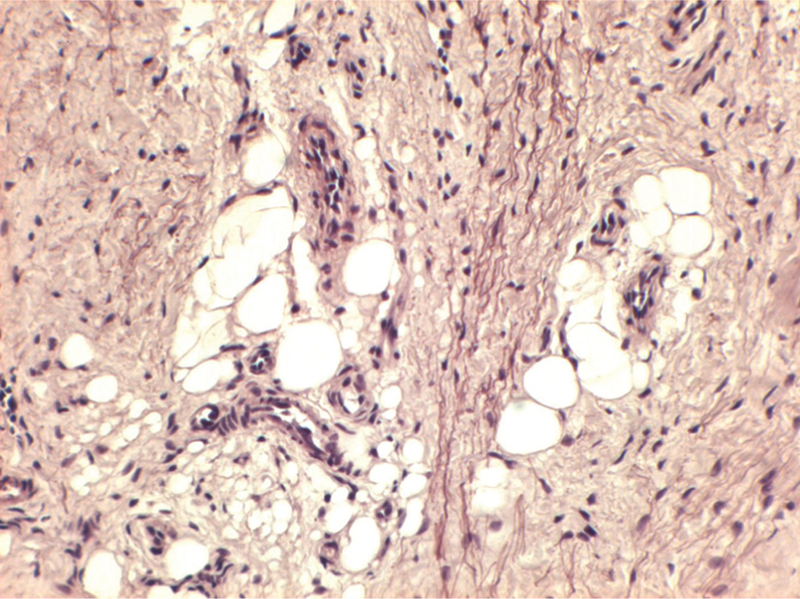 The excised tissues were studied histologically with different staining methods. Results The histological examination revealed the presence of large amount of neural elements (mechanoreceptors) together with abundant elastic fibers in all of the excised subtalar tissues. Conclusion Our findings suggest that the sinus tarsi is a neurosensitive elastic organ and has a proprioceptive information mechanism. This may be of great value in the treatment of patients with flexible flatfeet using subtalar implants. Pes planus deformity, also known as flatfoot, refers to loss of the normal medial longitudinal arch. Pes planus in children and adults is usually flexible, and on non-weight bearing, a normal-appearing arch is present . Flexible flatfoot in children is one of the most common disorders in orthopedics . It is anatomically described as excessive pronation during weight bearing owing to anterior and medial displacement of the talus. It may be congenital in nature or may be acquired in adulthood owing to posterior tibial tendon dysfunction, which in turn may be caused by trauma, overuse, and inflammatory disorders. Symptoms include dull aching, throbbing, and cramping pain, which in children may be described as growing pain . Conservative treatments include orthotics or shoe modifications . However, persistent pronation of the subtalar joint during the propulsive phase of gait is mostly responsible for major deformities in adult life . Hallux valgus, metatarsalgia, tarsal tunnel syndrome, posterior tibial tendon dysfunction, and osteoarthritis of the subtalar and midtarsal joints are often the consequences and the ‘natural history’ of this deformity . To avoid these problems, surgical correction of the deformity during growth is recommended . The goal of surgical treatment is to correct the subtalar pronation, thereby restoring the appropriate relationship between the talus and the calcaneus . The procedures that have been described are arthrodesis, osteotomy, and arthroereisis. While arthrodesis is indicated in adults with degenerative changes in the subtalar joint, osteotomy and arthroereisis are the two principal options for children . Subtalar arthroereisis (also referred to as arthroisis) has been investigated as a surgical treatment of pes planus. This procedure is most often performed on young children and is designed to correct excessive talar displacement and calcaneal eversion by placing an implant in the sinus tarsi, a canal located between the talus and the calcaneus. The subtalar implant acts as a spacer to block the anterior and inferior displacement of the talus, thus allowing normal subtalar joint motion but blocking excessive pronation and the resulting sequela. In children, insertion of the implant is frequently offered as a standalone procedure, whereas adults often require adjunctive surgical procedures on bone and soft tissue to correct additional deformities . Subtalar arthroereisis has been performed for many years with a variety of implant designs and compositions . Many authors have described various surgical techniques of subtalar joint arthroereisis in the treatment of flexible flatfoot. Some authors advocate the use of bone grafts in the sinus tarsi to limit excessive subtalar joint pronation, whereas others advocate the use of endoprosthetic devices . It was suggested that the postoperative improvement is because of the mechanical restoration of the talocalcaneal alignment with remodelling of the subtalar joint . On the contrary, Pisani  suggested that the effect of the implant may not be only mechanical in nature but also there may be a proprioreceptive information mechanism present in the sinus tarsi. Valenti  speculated that the foot is responsible for the balance of the whole body, and the proprioception in the foot plays a very important and indispensable function in controlling upright posture and automatic walking. He hypothesized that the proprioceptive subtalar center is the mechanism for correction and adjustment of gait . The aim of our study is to identify the neurohistological nature of the subtalar tissues in an attempt to clarify the mechanism of action of sinus tarsi implants used for correction of flexible flatfeet. From 46 patients, soft tissue material was obtained from the sinus tarsi during operative intervention in the foot for different indications. The age of the patients ranged from 8 to 77 years (mean, 39 years). Twenty-six patients were male. The specimen were fixed in a standard procedure with buffered formaldehyde and transferred to paraffin embedding by dehydration with a concentration of alcohol. Slices were taken at 7 μm thickness. Histochemistry was performed for orientation in haematoxylin according to Mayer, trichrome according to Goldner and Azan according to Heidenhain. Special interest was given to the amount of elastic fibres. Therefore, staining with Orcein according to Fränkel and counter staining with haematoxylin were done . 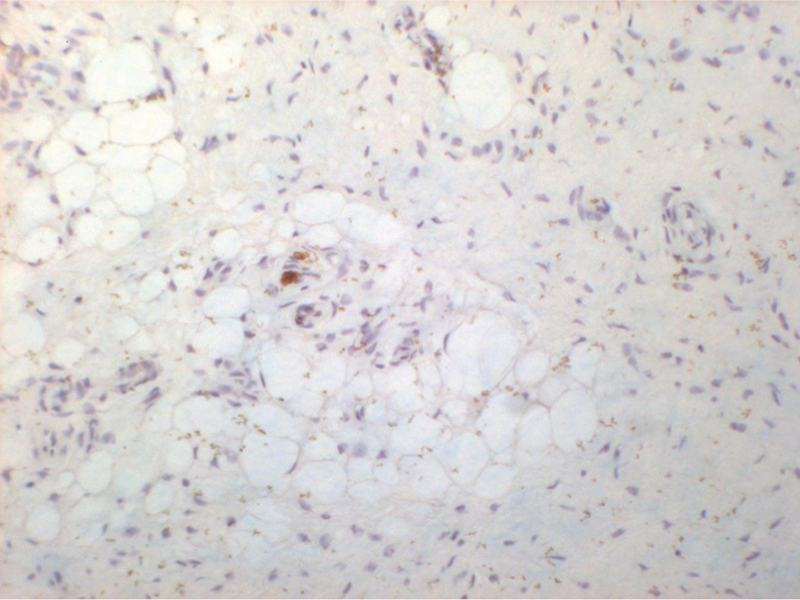 First, immunohistochemistry was carried out against neurofilament with monoclonal antibodies (mouse-anti-human, code M0762 ) and marked with diaminobenzidin for specific detection of neuronal cells. Second, a polyclonal antibodies detection against Myelin basic protein (rabbit-anti-human, code A0623; Dako ) was performed. Histological examination using trichrome, haematoxylin, and Azan staining revealed arrangement of the collagenous fibers in a parallel curly running manner ([Figure 1]). This is normally owing to elastic fibers attached to the collagenous fibers. The elastic fibers can be detected with specific histochemistry like Orcein. By performing this staining, a huge amount of elastic fibers was found ([Figure 2]). Moreover, neurofilament-positive structures attached to vessels and a lot of separate ones between the connective fibres were discovered ([Figure 3]). Figure 1 Arrangement of the collagenous fibers in the sinus tarsi, with haematoxylin staining. Note the parallel curly run. 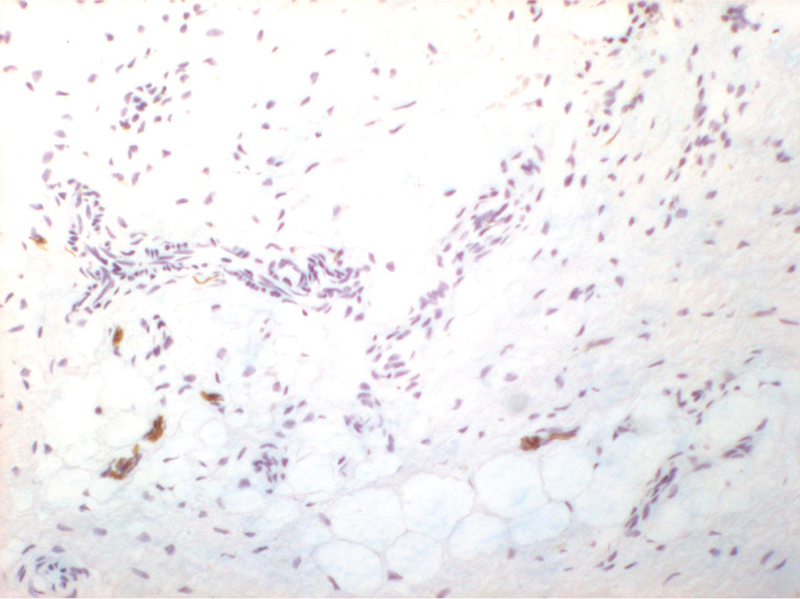 Figure 2 Orcein staining, showing abundant elastic fibers parallel to collagenous fibers. Note the deep brown filaments. Figure 3 Neurofilament staining with diaminobenzidin. Small arrows indicate innervation of the vessels, whereas big arrows point to isolated neuronal fibers within the connective tissue. To estimate the amount of myelinated fibers, antibodies against myelin basic protein were used. This lead to the discovery of widespread single neuron fibers scattered all over the sections, and this was mostly in younger patients ([Figure 4]). Figure 4 Myelin basic protein-positive structures disseminated all over the section. Note brown points in the image. Flexible flatfoot is one of the most common disorders in orthopedics . Despite numerous papers published in the literature, the definition and etiology of flexible flatfoot; the level of disability that it may cause; and the opportunity, the appropriate time, and the methods of its treatment are still open to debate . Subtalar arthroereisis has been performed as a surgical treatment of pes planus. This procedure is designed to correct excessive talar displacement and calcaneal eversion by placing an implant in the sinus tarsi . It was suggested that the postoperative improvement is because of the mechanical restoration of the talocalcaneal alignment with remodelling of the subtalar joint . Although some authors have investigated the biomechanics and vascular supply of the sinus tarsi, there have been few studies on its innervation. Mechanoreceptors function as biological transducers which convert mechanical stress into nerve impulses. Mechanoreceptors around the joints have been identified in studies of the anterior cruciate ligaments , meniscus of the knee , lumbar spine ligaments , and the subacromial bursa of the shoulder . These receptors play a role in the synchronization involved in the control of movement . Our histological examination revealed the presence of large amount of neural elements (mechanoreceptors) together with abundant elastic fibers in all of the excised subtalar tissues. The presence of the mechanoreceptors in the sinus tarsi indicates that the mechanical state of this organ is monitored by the central nervous system and hence the sinus tarsi may participate in proprioception. Valenti  speculated that the foot is responsible for the balance of the whole body, and the proprioception in the foot plays a very important and indispensable function in controlling upright posture and automatic walking. He hypothesized that the proprioceptive subtalar center is the mechanism for correction and adjustment of gait . Viladot et al. have reported that the sinus tarsi is an evolutionary structure. They concluded that the canal ligaments have a mechanical function and that the sinus tarsi proper ligaments have a proprioceptive function . This was also confirmed later on by more recent studies ,. In a study presented by Akiyama et al. , histological examination of the sinus tarsi synovial tissues in 47 patients with sinus tarsi syndrome was performed. The examination revealed abundant neural elements among which free nerve endings appeared to predominate. They also detected some types of mechanoreceptors. They concluded that the sinus tarsi is not only a talocalcaneal joint space with interosseus ligaments but a source of nociceptive and proprioceptive information regarding the movement of the foot and ankle . The presence of the mechanoreceptors together with the abundant elastic fibers in the sinus tarsi proved by our study may confirm that the sinus tarsi is not merely a posterior subtalar joint with only biomechanical function but rather a neurosensitive elastic organ. This in turn may prove that the postoperative improvements with the use of subtalar implants in patients with flexible flatfeet are not only mechanical in nature, but there is also a proprioceptive information mechanism present in the sinus tarsi. Moreover, with this new knowledge about the neurosensitive elastic organ ‘sinus tarsi’, it seems to be advisable to apply the subtalar corrective implants with only very little soft tissue damage. Mosca VS. Flexible flatfoot in children and adolescents. J Child Orthop 2010; 4:107–121. Fabry G. Clinical practice. Static, axial, and rotational deformities of the lower extremities in children. Eur J Pediatr 2010; 169:529–534. Nemeth B. The diagnosis and management of common childhood orthopedic disorders. Curr Probl Pediatr Adolesc Health Care 2011; 41:2–28. Evans AM, Rome K. A Cochrane review of the evidence for non-surgical interventions for flexible pediatric flat feet. Eur J Phys Rehab Med 2011; 47:69–89. Harris EJ, Vanore JV, Thomas JL, Kravitz SR, Mendelson SA, Mendicino RW et al. Diagnosis and treatment of pediatric flatfoot. J Foot Ankle Surg 2004; 43:341–373. Harris EJ. The natural history and pathophysiology of flexible flatfoot. Clin Podiatr Med Surg 2010; 27:1–23. Rose R. Flat feet in children: When should they be treated?. Internet J Orthop Surg 2006; 6:1. Labovitz JM. The algorithmic approach to pediatric flexible pes planovalgus. Clin Podiatr Med Surg 2006; 23:57–76. Blitz NM, Stabile RJ, Giorgini RJ, DiDomenico LA. Flexible pediatric and adolescent pes planovalgus: conservative and surgical treatment options. Clin Podiatr Med Surg 2010; 27:59–77. Nelson SC, Haycock DM, Little ER. Flexible flatfoot treatment with arthroereisis: radiographic improvement and child health survey analysis. J Foot Ankle Surg 2004; 43:144–155. Needleman RL. A surgical approach for flexible flatfeet in adults including a subtalar arthroereisis with the MBA sinus tarsi implant. Foot Ankle Int 2006; 27:9–18. Metcalfe SA, Bowling FL, Reeves ND. Subtalar joint arthroereisis in the management of pediatric flexible flatfoot: a critical review of the literature. Foot Ankle Int 2011; 32:1127–1139. Pisani G. Pes planovalgus. In: Pisani G, editor. Foot surgery. New York, NY: Thieme; 1998. pp. 156–161. Valenti V. Proprioception. In: Helal B, Wilson D, editors. The foot. Edinburgh: Churchil Livingstone; 1998. pp. 87–95. Romeis B. Mikroskopische technik. 17th ed. Urban & Schwarzenberg: München-Wien-Baltimore; 1989. pp. 50–95. Herrmann H, Aebi U. Intermediate filaments: molecular structure, assembly mechanism, and integration into functionally distinct intracellular Scaffolds. Annu Rev Biochem 2004; 73:749–789. Kies MW. Myelin basic protein. Scand J Immunol 1982; 15(Suppl 9):125. Pfeiffer M, Kotz R, Ledl T, Hauser G, Sluga M. Prevalence of flat foot in preschool-aged children. Pediatrics 2006; 118:634–639. Evans AM. The flat-footed child − to treat or not to treat − what is the clinician to do?. J Am Podiatr Med Assoc 2008; 98:386–393. Needleman RL. Current topic review: subtalar arthroereisis for the correction of flexible flatfoot. Foot Ankle Int 2005; 26:336–346. Giannini S, Ceccarelli F, Benedetti MG, Catani F, Faldini C. Surgical treatment of flexible flatfoot in children. A four-year follow-up study. J Bone Joint Surg Am 2001; 83:73–79. Adachi N, Ochi M, Uchio Y, Iwasa J, Ryoke K, Kuriwaka M. Mechanoreceptors in the anterior cruciate ligament contribute to the joint position sense. Acta Orthop Scand 2002; 73:330–334. Assimakopoulous AP, Katonis PG, Agapitos MV. The innervation of the human meniscus. Clin Orthop 1992; 275:232–236. Yahia LH, Newman N, Rivard CH. Neurohistology of lumbar spine ligaments. Acta Orthop Scand 1988; 59:508–512. 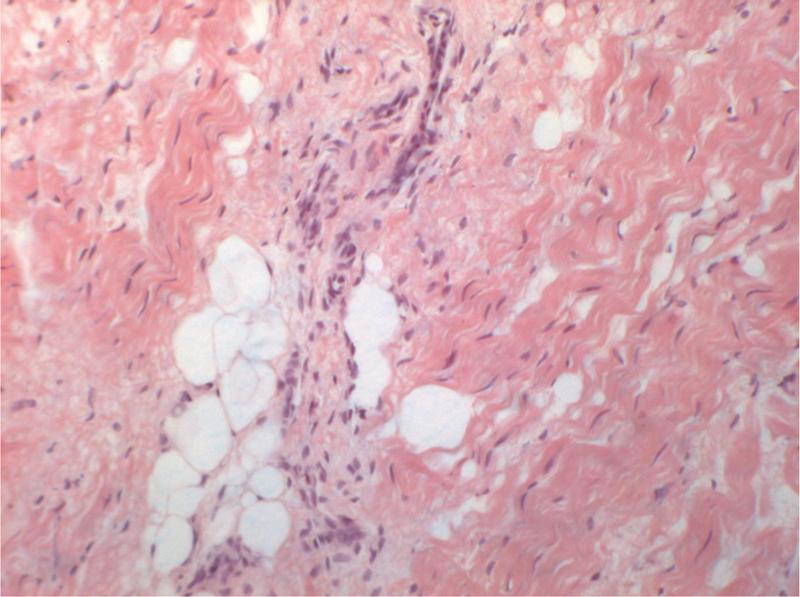 Tomita Y, Ozaki J, Sakurai G. Neurohistology of the subacromial bursa in rotator cuff tear. J Orthop Sci 1997; 2:295–300. Zimny ML. Mechanoreceptors in articular tissues. Am J Anat 1988; 182:16–32. Viladot A, Lorenzo JC, Salazar J. The subtalar joint: embryology and morphology. J Foot Ankle Surg 1984; 5:54–66. Rein S, Manthey S, Zwipp H, Witt A. Distribution of sensory nerve endings around the human sinus tarsi: a cadaver study. J Anat 2014; 224:499–508. Rab M, Ebmer J, Dellon AL. Innervation of the sinus tarsi and implications for treating anterolateral ankle pain. Ann Plast Surg 2001; 47:500–504. Akiyama K, Takakura Y, Tomita Y, Sugimoto K, Tanaka Y, Tamai S. Neurohistology of the sinus tarsi and sinus tarsi syndrome. J Orthop Sci 1999; 4:299–303.